I'm being a little disingenuous in the title, I have to admit. It's true that the titles below represent my 'Top 5' VR titles, but they're also just about the only VR titles on the platform (I counted to 9 and then realised I couldn't make a 'top 10'! 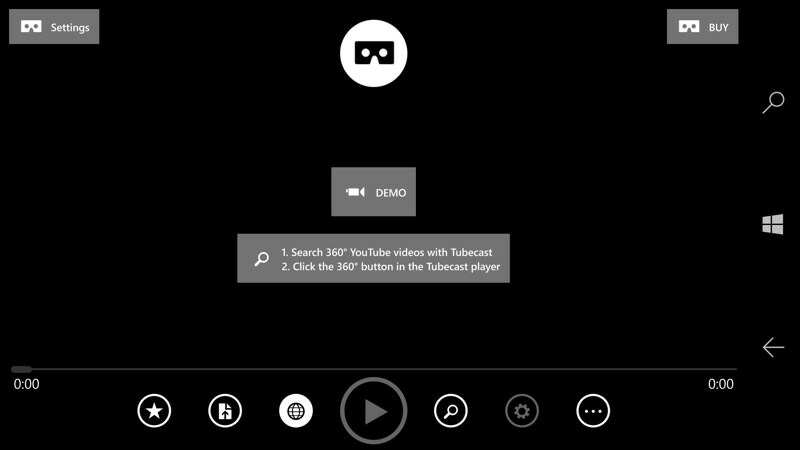 Contrast this to ten times that number on Android, proving that VR on Windows 10 Mobile is still in its infancy. VR is still fun to play with though - all you need is a phone with enough screen resolution (1080p is enough here) and a VR viewer (readily available for under £10 anywhere). Although you can play with Virtiual Reality (VR) on any phone in a suitable holder* of course, the higher the resolution the better (1080p minimum) and - one aspect which often gets overlooked - the better the phone speakers the better. True, you can use headphones to experience even more immersion in your virtual environment, though you really are then dead to the world in terms of awareness of your surroundings, which could prove embarrassing. "Dad! Mum says your dinner's going cold! "; or "Die, you zombies!" shouted out loud at your desk in your lunch hour while you don't realise that your boss is standing beside you; or whatever other potentially awkward situation you can think of. * If you don't own a VR phone holder yet, try this one on Amazon UK - it's decent quality and not expensive. If you're on your own and not expecting the doorbell or phone (etc.) then you can get away with headphones, but I took the safe option and tested the applications below on the HP Elite X3, which has reasonably loud stereo speakers. But you'll still fare quite well with other Window 10 Mobile phones - just turn the volume up using the physical buttons before inserting the phone into the VR viewer. 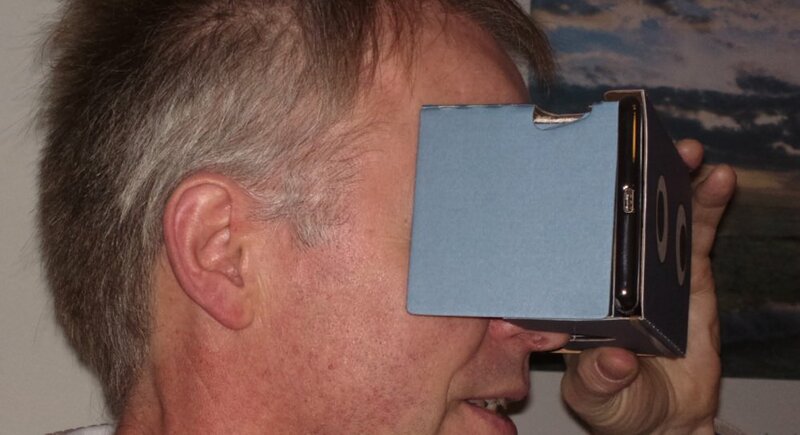 The HP Elite X3 in one of the cheap supermarket-style cardboard VR visors. It's probably not worth shelling out for something fancy until there's more actual content? 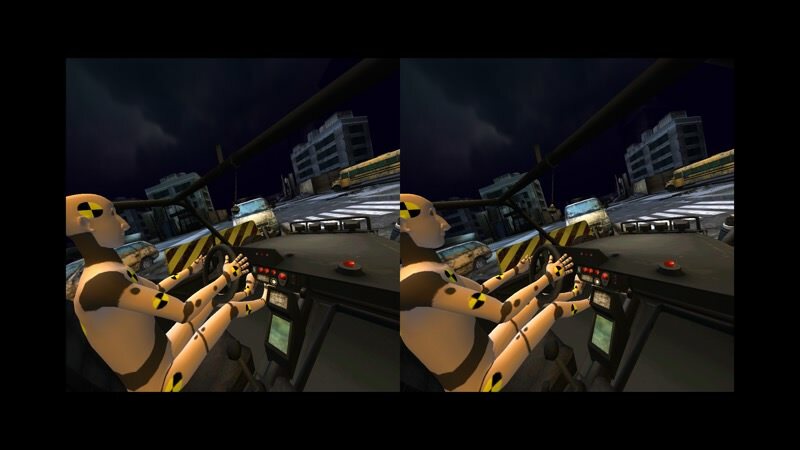 VR here refers to any content that can take advantage of the stereo (audio and vision) immersive experience of the headset/holder - the two main aspects are a 3D effect, a.k.a. 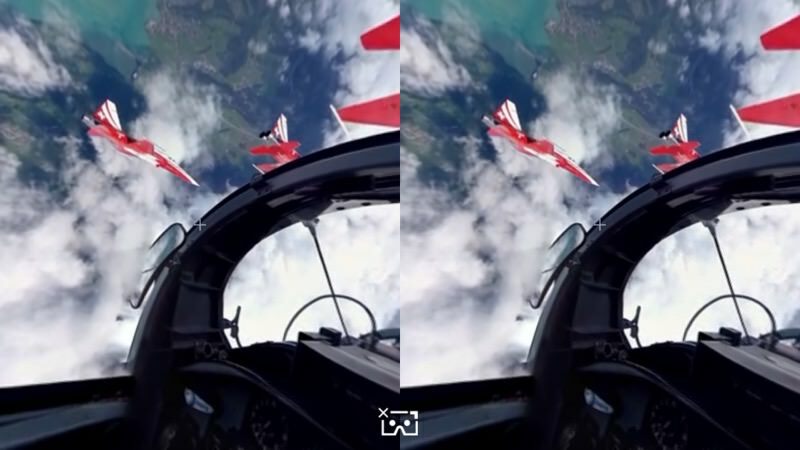 stereoscopy, feeding subtly different viewpoints into each eye, and 360 degree views, i.e. you can rotate your head(set) to see all around you (and up and down). The best and most immersive 3D content and applications use both techniques at once, of course, but the choice is slightly more limited in the Windows 10 Mobile world, so I've sourced the best i can. VR applications, as you might expect, given the graphical content, do need a little more RAM than simple 2D/non-360/single-POV graphics. I'd suggest 2GB RAM as a recommended minimum, so don't expect everything to work on a (e.g. Lumia 640). 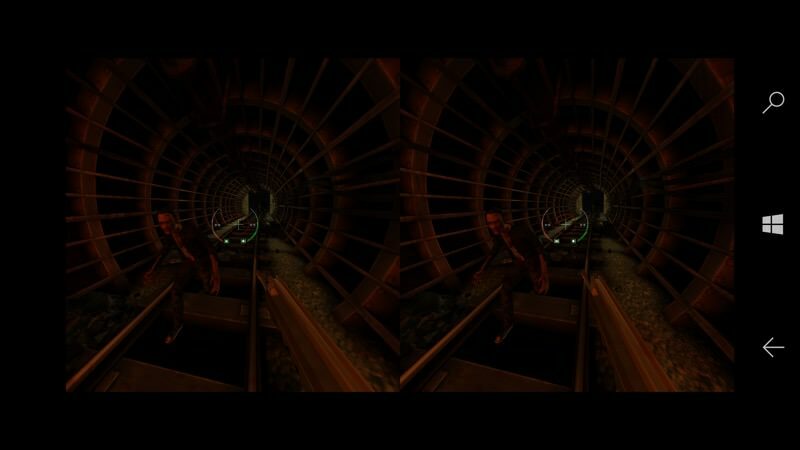 Some of the screenshots here are showing the full VR view, i.e. what both eyes see, so that you can get a feel for the application in action - obviously, you're not seeing the full 3D/360 effect in static 2D and reduced on this web page! Viewing VR content, however good your eyes and the quality of the lenses in your viewer, can cause eye strain. And/or dizziness or disorientation, so limit your time within any VR applications - I speak from experience. 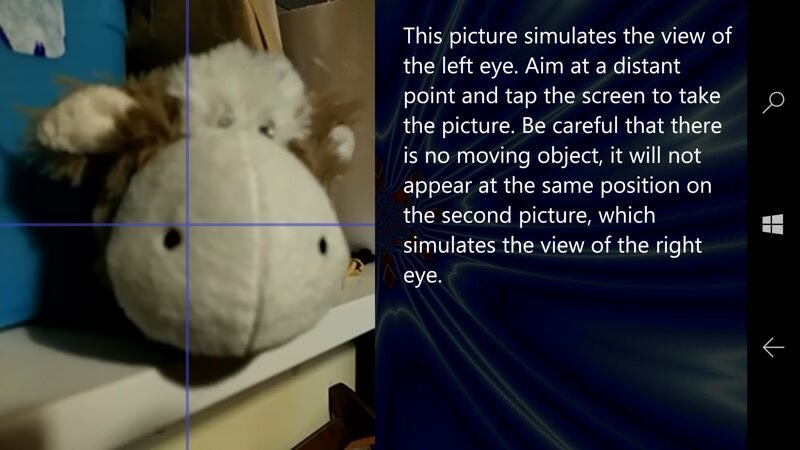 In some of the screenshots below, the Windows virtual controls are showing - you get slightly more VR screen area by dismissing these, but equally you then have to swipe them back in when you want to get out of the VR app again. On the Elite X3 I could get away with leaving them in place since the physical display is so big, but on phones with screens below 5.5" you'll want to make sure to dismiss the controls every time. It's a fair cop, Mad Race is more a demo than a game, but it's still a heck of a thrill ride. Set in a post-apocalyptic city-scape, you're lined up to race around the buildings, past obstacles, over ramps, and so on. You're not in control in terms of driving, you have a robot driver for that, so you're just there for the ride. But you get to look all round and enjoy the massive, huge thrills and spills along the way. 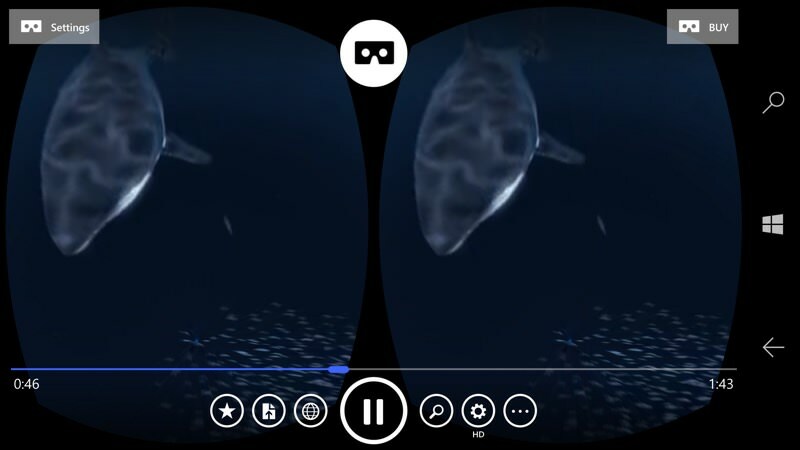 Although you wouldn't want to watch/experience this more than a couple of times, it's a good 'wow' demo, with impressive digital stereo sound, to show friends when they ask about VR on your phone. 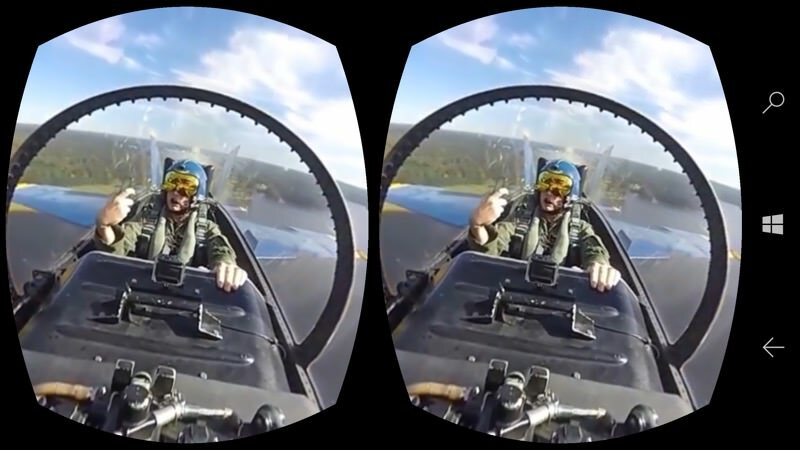 This application makes VR something of a DIY chore, but you do end up with 360 VR photos and videos of, more or less, the subjects of your choice. The idea is to find 360 degree photos or videos online (e.g. 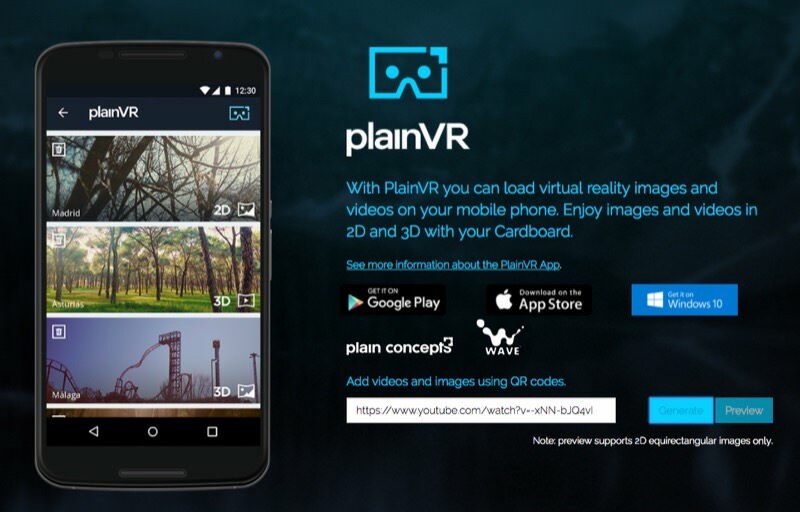 on a desktop) and then paste the URL for the image/video into http://vr.plainconcepts.com/ This then generates a QR code for plainVR to access and grab - give the image a name and it's saved in VR form within the application, ready for you to enjoy in the future. That's quite a few steps, but with a few of your favourite panoramas or 360 degree videos processed and saved, you can enjoy them at any time or use them to demo VR to others. Probably the lowest tech application here, but still cool to play with, this gets you taking the same photo from two different viewpoints, i.e. couple of inches apart but focussing on the same point, just as your eyes would see something. A ghost image from the first shot helps you line up the second and results are generally not too hit and miss. The upshot is that you can take genuine 3D photos of anything, at least for viewing within the application. It sounds a bit limiting, but snap your partner or pet or favourite toy (if they'll all stay still enough while you take the two photos) and you've got a genuine 3D, 'real' photo of something you're interested in. Lots of experimentation needed, obviously, and the resolution isn't great, but get lucky and you'll have lots of fun with this one. Amazingly atmospheric, this is part demo, but also partly a decent VR first person shooter. Think strolling through neon-lit (again post-apocalyptic!) 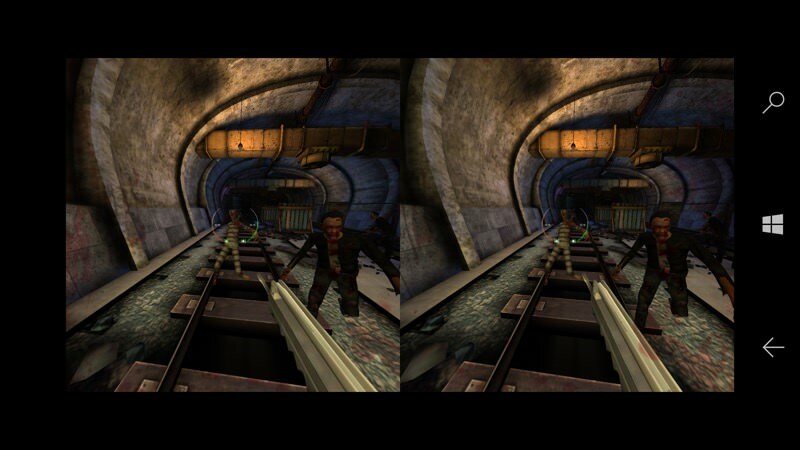 tunnels and advancing zombies - you shoot where you look, effectively, even if the walking and navigation is largely on rails (literally, this being set in a train complex!) There's no real danger, in terms of being attacked and dying, but there's still a certain adrenaline rush in not knowing where the zombies will come from next and in working out in what order to machine gun them down. Again, a full stereo soundtrack impresses on the Elite X3 or with the use of headphones. This is the first point in the VR adventure where you'll need to dip into your wallet, since both Video 360 and the YouTube client it hooks into for discovery are commercial applications. But the expense is worth it - there are hundreds, if not thousands, of 360 degree (and usually 3D too, to a degree) videos on YouTube now and you can view the lot using this application. Unlike with plainVR, this is search and play, with no DIY needed. 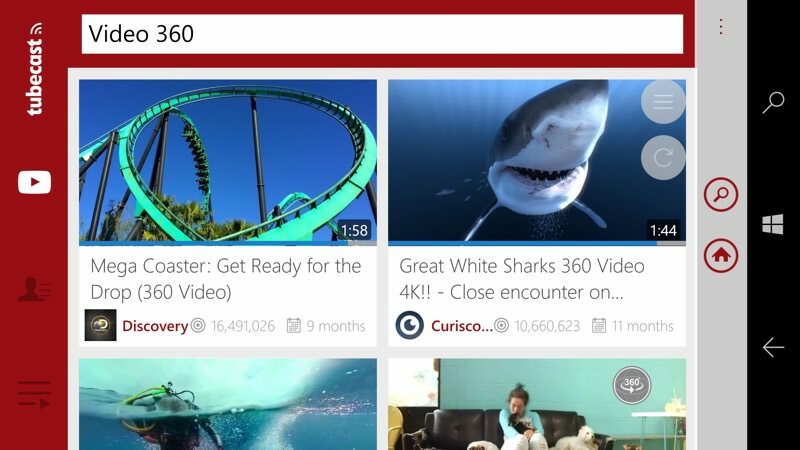 Slightly disconcertingly, the 'search' function in Video 360 actually kicks off the developer's other main application, Tubecast for Youtube PRO, which is also commercial software after the first few 'demo' runs. But the investment is worth it, since the handover is flawless and you'll soon be immersed in YouTube 'Video 360' content and then exploring from there. Slightly curiously, on one of my Windows phones, Video 360 suddenly decided to ignore the accelerometer and gyro, so not so much of the '360', but I'll forgive this as it was flawless on the other devices. The whole software area is very much unfinished (on all platforms), there are a lot of bugs to quosh across all applications, a lot of new apps to create and, of course, an awful lot of VR content to create. In the meantime though, I wanted to highlight that there are VR titles for Windows 10 Mobile - and that anyone can install and run them as long as they don't have low end phone hardware. Comments welcome if you've tried the titles above or if you can suggest an application or game that I've missed.